Empowering Employees To Be Heard - Bank of Southern California N.A. The 2014 Midterm Elections marked the lowest voter turnout in 72 years. California, a state with one of the largest populations, reported one of the poorest turnouts, with nearly 32% of voting-eligible Americans participating. When asked why registered voters didn’t make it to the polls, a full two-third indicated they simply didn’t have the time. Of this group, 35% revealed that scheduling conflicts with work or school kept them from the polls. We must learn from our history and pave a new future– one where employees are not only allowed but encouraged to take time to vote. 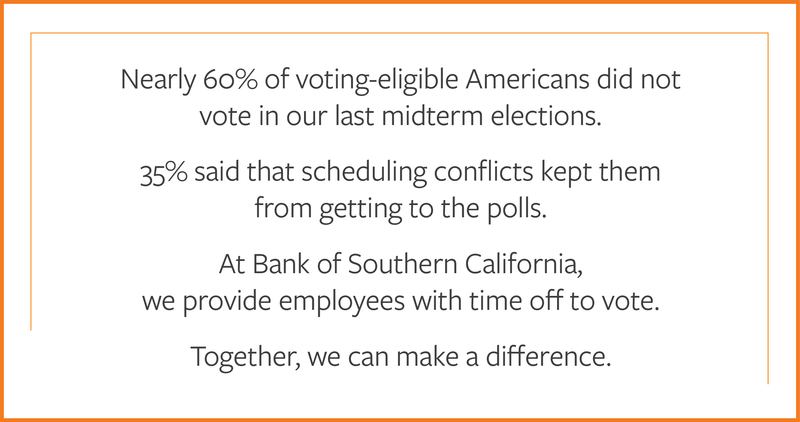 That’s why we have joined forces with ElectionDay.org in a nonpartisan effort to empower staff to engage in the democratic process and make their voices heard. In addition to providing employees with paid time off to vote, we are also sharing vital information on how to register, locate their polling place, obtain an absentee ballot, and more. We are proud to be one of the first banks to join the movement and we encourage other banks and financial institutions to do the same. As the list of participating businesses continues to grow nationwide, now topping 200 businesses, we are confident that this will set us in a new direction– one where democracy can prevail. Nathan Rogge is the President and Chief Executive Officer of Bank of Southern California. With nearly 30 years of banking experience, he has a proven track record in the industry and a commitment to success. He is based out of the Bank’s corporate headquarters in Del Mar.